Bronwen is interested in food, diet, and creating recipes, as she has prepared family meals and organised church and home functions. 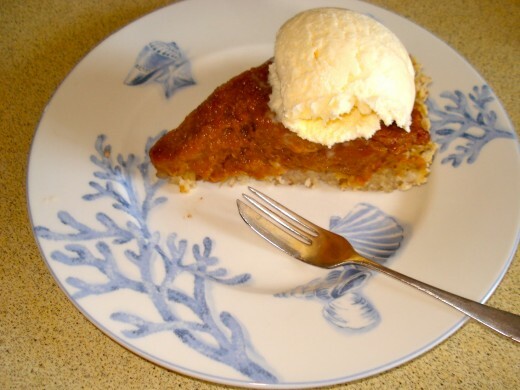 I don't always like pumpkin pie and most of them are made with traditional wheaten flour that upsets me, but this recipe seems to work quite well. 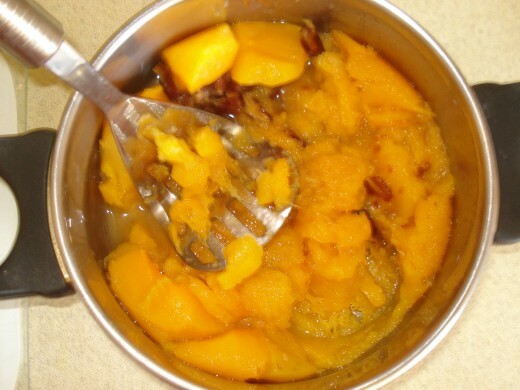 It uses alternative ingredients and yet it is not really complicated and does not take too long to prepare, especially if you cook the pumpkin while the base is being made. However, there are a few pointers that may help. The cinnamon and mixed spice add to the flavour and the dates add to the nutrition and colour of the pie. It's best to keep the base fairly thin, as it takes a while to cook if it is thick and could also burn on the outside. Just about any kind of pumpkin will work with this recipe, but I like Queensland Blue because it is firmer and has a good colour and flavour. I must admit it is harder to cut and peel, though, so do watch your fingers! The pumpkin can easily be cooked the day before and stored in the refrigerator, ready for when you have time to make the base. Sometimes when I make this pie I need to cook it for longer, so do test it before removing it from the oven. If it does not all disappear, it can be frozen. 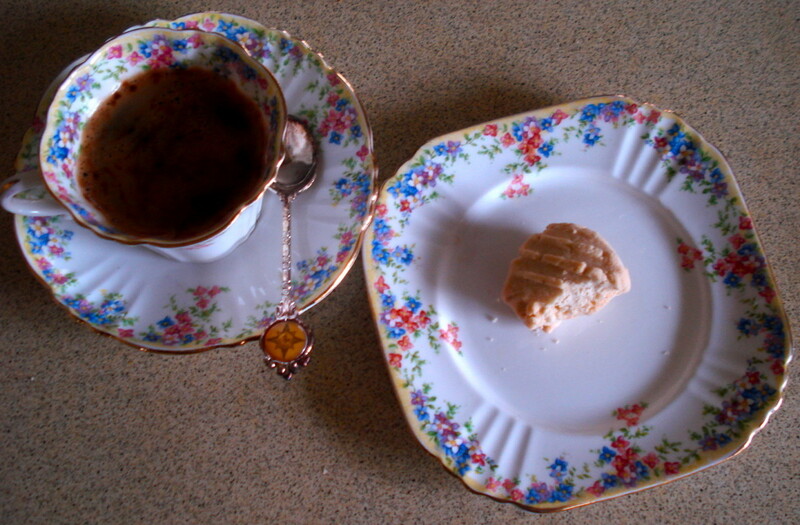 If you do not want to add the sugar or honey, it works quite well without these. If you do not want to add the egg, but can tolerate sugar, use a couple of tablespoons of Golden Syrup. It works well as a substitute. Cut the pumpkin into manageable pieces, peel, and steam until cooked. Break up dates, place in a bowl, pour boiling water over and leave until needed. In a good-sized bowl, mix together the flour, almond meal, linseed meal and half the cinnamon. Mix in the oil and some water and add to the dry ingredients in the bowl. Stir together and continue to add water until the dough is a good consistency. 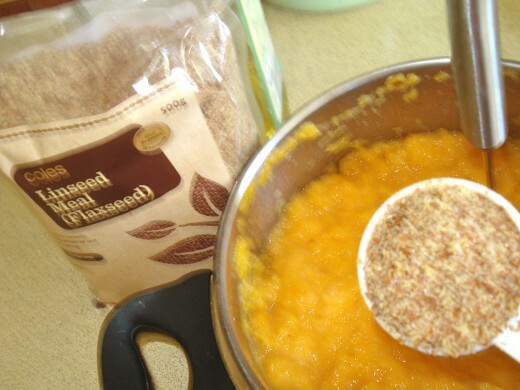 If you inadvertently add too much water, a little linseed meal will help to absorb the liquid. 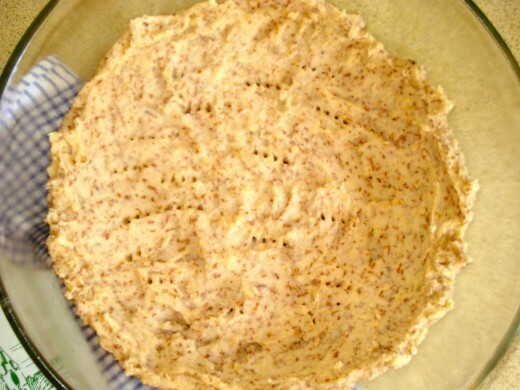 Press the dough into flan dish or similar. Make sure it comes up the sides. Cook in an oven at 180 C for about half an hour. Make sure it is cooked before removing from the oven. While the base is cooking, mash the pumpkin with the dates. Add the beaten egg, the remaining cinnamon, mixed spice, sugar and honey. If it is not moist enough add a little water. 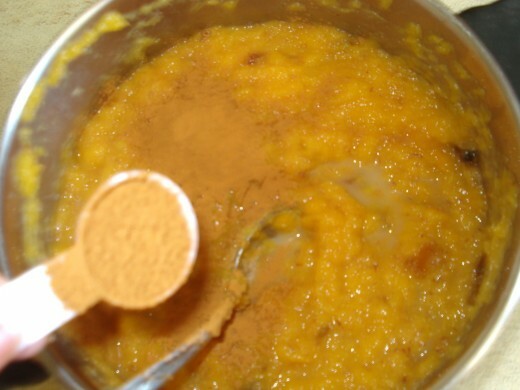 When the base is cooked, remove from the oven, spread the pumpkin mixture over it and return to the oven for about half to three-quarters of an hour. Make sure it is firm before removing from the oven. Cool. 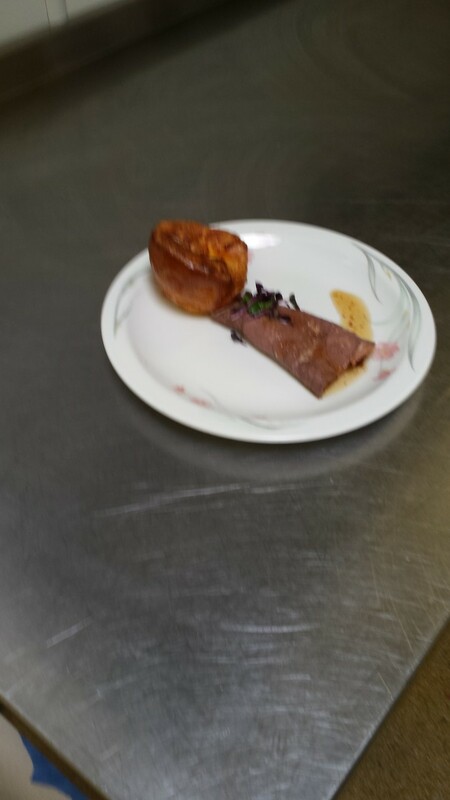 Remove to serving plate and cut required slices. I served it with ice-cream, but it would be nice with coconut cream, too. Enjoy! joedolphin88: How lovely! I hope it goes well and that he loves it. My father loves pumpkin pie, I'll be making this for him for fathers day. Thank you for the excellent recipe. I wonder if you've tried it yet? I'd love to know how it went. Thank you for your vote and comment. I love pumpkin pie. In fact, I´m planning to bake one this week. Thanks for sharing the recipe. I might try this. Voted up and pinned! aviannovice: Thank you. Yes, I think a lot of people suffer without realizing the cause, or else they like certain foods and cannot imagine living without them, but it's certainly worth the effort to be without pain. This is definitely a winer with me. I found another person at work that is definitely gluten intolerant. Seems to me that this is a lot more common than most people thunk or even realize. No. They don't grow well in warmer climates. When we lived in the tropics I tried to grow them, but the few that were produced were very watery and did not mature, however, the leaves provided a green vegetable that was acceptable to the children, and we'd never used them before! Oh, I see, we dont have that here in the Philippines as well. Anyway. PaoloJpm: No, we don't usually have them in Australia, either, they're an American thing and we used to think that pumpkin is a vegetable and would not be good as a dessert, but it is really nice. I never tasted one, but seems good hope to try one in some time. Vellur: Thank you, it is! sachithsenanayake: It tastes great. Thank you for your comment. rebeccamealey: Yes, gluten free may be sometimes a fad, but it's really helpful when it's needed and it does make people feel better - no more pains in the tummy after a meal. DanaTeresa: So glad that it is helpful. Hope you enjoy it. This looks yummy! I am always glad to find gluten free recipes. I love pie too so this is perfect.... thank you. Sounds...and looks delicious. I know several people that have gone gluten free and feel better. Thanks for sharing! Mmm that looks soo yummy! 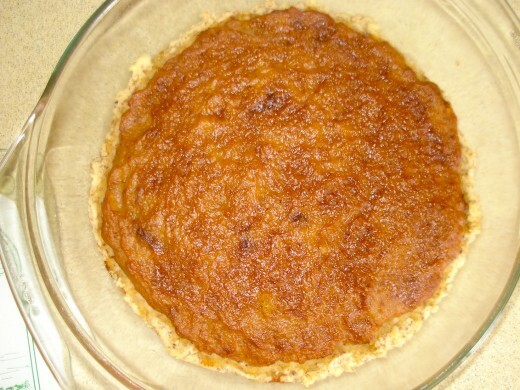 A yummy and delicious gluten free pumpkin pie recipe, thank you for sharing. mackyi: That sounds like a great idea. Hope you love it. AliciaC: I used to think it would taste weird, as I love roasted pumpkin, but I've certainly changed my mind. It's so versatile. Thank you for your comments. I love pumpkin pie, especially with ice cream. I also need to limit the amount of wheat that I eat. This sounds like a great gluten free pie! I like the idea of adding coconut cream to it, too. Thanks for sharing the recipe, Blossom. Mekenzie: I'd never thought of using canned pumpkin. That would certainly make the job easier and much faster, too. However, I don't know whether the canned variety would lose some of it's goodness, that's a good question. It's possible, as it has to be cooked a second time in the pie. Teaches12345: Too late! I've eaten it! Seriously, it does taste good, so I'm glad you like the recipe. barbat79: Great! I hope your friend likes it. 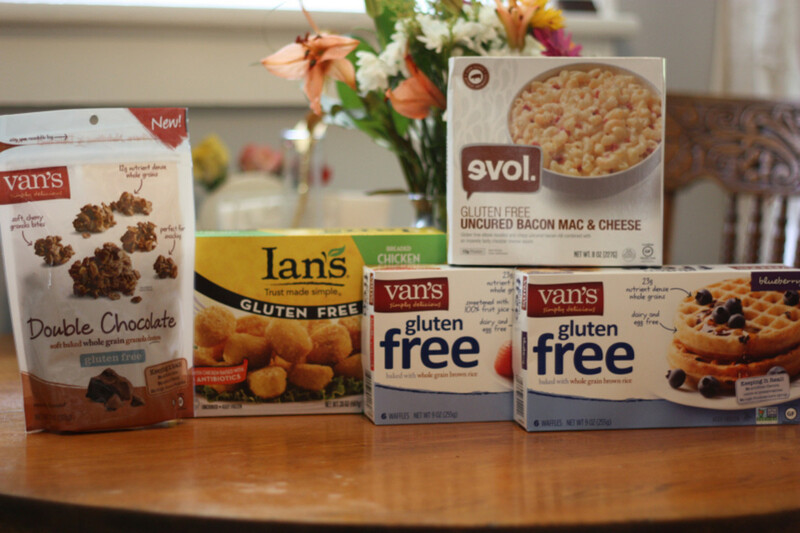 Frank Atanacio: Gluten free is really just normal food, but just choosing things that don't have gluten in them. Thank you for the stars! jo miller: So glad that it will be useful for you. FlourishAnyway: It's fun and a pleasure to share. Thank you for your comment. 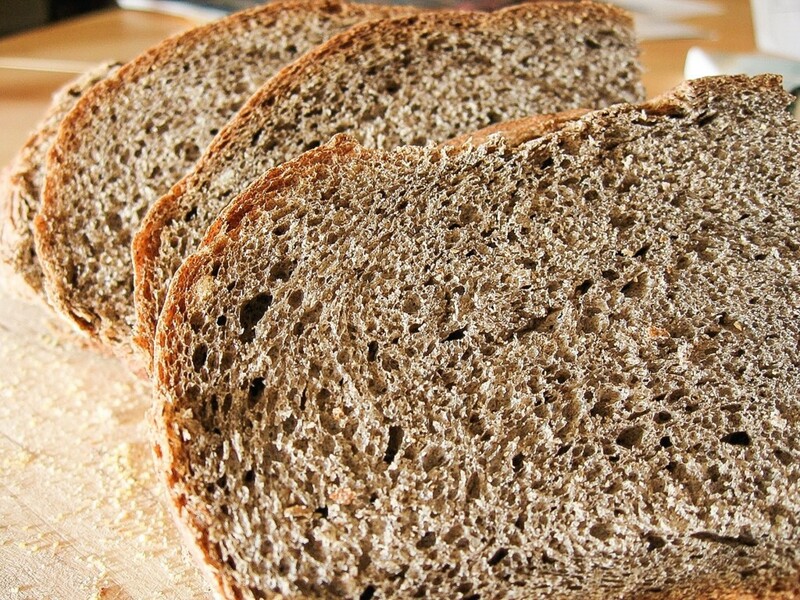 This is a good alternative for those among us who are sensitive to gluten. Thanks for sharing. Just the type of recipe I need now. Will bookmark for later. Thanks for sharing. Great recipe...I forwarded the link to my friend who strives for these types of recipes Thanks Blossom!! This is my type of pie: healthy and gluten-free. I am so wanting that slice you cut from the pie! Voted way up and pinning. I must say I am impressed with you dear Blossom! I have never made a pumpkin pie from a real pumpkin - only used canned pumpkin. Is there a real benefit to using the fresh pumpkin - if not I'm not sure I'd put the energy into preparation etc. of a real pumpkin. I just got put on a gluten free diet so this recipe is timely for me. The pictures look scrumptious. Thanks for another very helpful hub! sujaya venkatesh: Yes, it is, as well as being tasty. Faith Reaper: Bless you! Thank you for your enthusiastic comments. mackyi: Do! It is delicious. always exploring: I'm sorry to hear you have this problem, but knowing the cause of the problem is great. Celiac disease is not fun, but with a bit of creativity it does not have to be too limiting. Eiddwen: I know! We always think of pumpkin as a vegetable, and I do love it - mashed or roasted, but the pie can be great, too. MsDora: The cinnamon flavour is great, but it's also very good for us, so it's healthy, too. Jackie Lynnley: I hope it works for you. Thank you for your comments. jhamann: I'm so glad, Jamie. I hope you enjoy it. MizBejabbers: I love your story! It's interesting what we can use and it still seems to work. I haven't tried a squash, but I really should - that's a great idea. 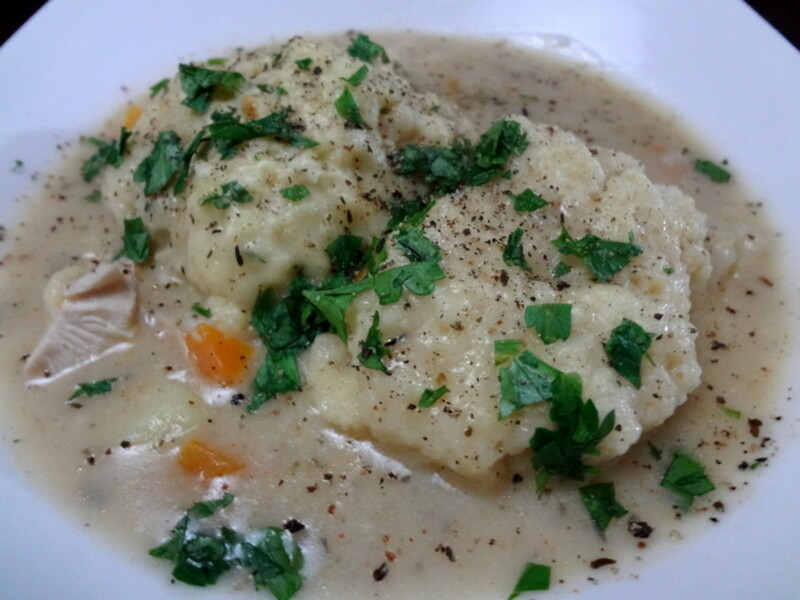 Well I am trying my best to go gluten free so thank you for a tasty looking recipe! Sounds healthy, looks healthy, must be healthy--and tasty too with that cinnamon flavor. Thank you for this gluten free recipe. I have never tried Pumpkin but you never know. I have not made a pie since i was diagnosed with celiac disease, i make lots of cakes using the gluten free cake mixes. This looks and sounds delicious, i will try it. Thank you Blossom. I'm going to put my pumpkins to use this year! Thanks for sharing this seemingly delicious recipe. 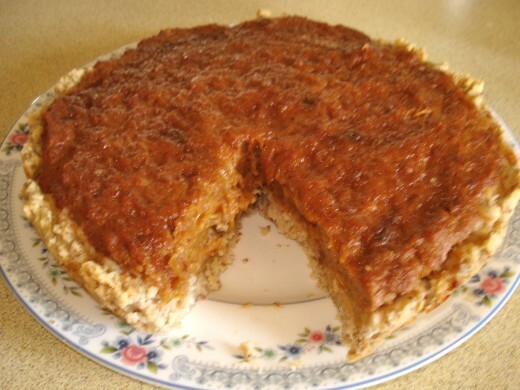 Oh, I love pumpkin pie, and it is even better gluten free! Thank you for sharing your recipe. It looks so delicious.